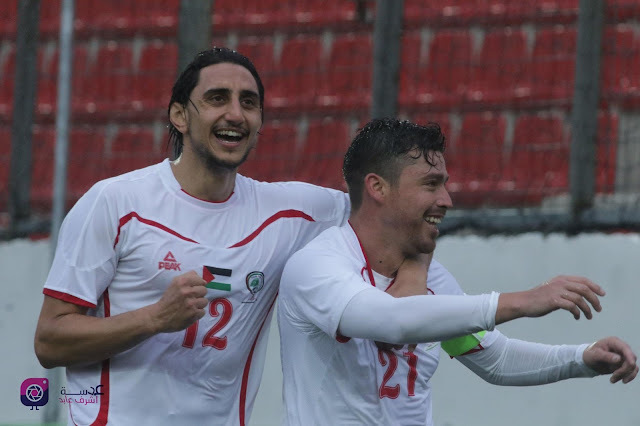 Recap: A damp late afternoon was the perfect setting for this international friendly that Palestine seemed to sleepwalk through for large portions of the game. Noureddine Ould Ali stayed with a familiar 4-2-3-1 shape but placed Alexis Norambuena in the heart of the defence. Palestine started impatiently, almost trying to force the issue through crosses and long balls to Mahmoud Wadi. Pakistan would take an unexpected lead through Hassan Bashir after a quick one-two on the left flank sprung him into the box. That goal broke a streak of 466 minutes without a goal conceded. Twenty minutes after conceding, Palestine would find an equalizer off a set piece- Mohammed Saleh flicked on header was drilled home by the captain on the day- Alexis Norambuena. That strike broke a record, perhaps one the Chilean born player wouldn't want, for oldest goalscorer in the history of the national team. At 34 years, 7 months, and 16 days beat the record Abdelatif Bahdari set last month against Tajikistan. The equalizer sparked Palestine into life and they seemed more likely to score but continued to squander opportunities or subvert their own attacks. The halftime interval did not do much to address the underlying issues affecting the team. The midfield play witnessed turnover after turnover forcing Ould Ali to hook Maraaba, Basim, and Jonathan- all of whom did very little to cover themselves in glory. Shadi Shaban was given a reprieve but he is also equally guilty of contributing to a poor performance. The changes did deliver the desired result. Tamer Seyam was far sharper in place of Jonathan Cantillana and the one player who can really hold his head high was another substitute. Nazmi Albadawi was spectacular in a 40 minute cameo, completely changing the pace of the game with his movement and linking the midfield with the attack excellently. His goal was not only well taken but well deserved and should cement his status within this team. Overall, the friendly was not the walkover many expected it to be and that is down to the work Jose Antonio Nogueria has done with the Pakistan national team. The endless looping balls to Mahmoud Wadi might have resulted in goals against a weaker side but not Pakistan. This is a side that is significantly better than its ranking. With the Asian Cup only 50 days away some players will be left ruing their performance today which might well cost them a spot in the starting lineup going forward. What I liked: This was only the second time Palestine came from behind to win a game in normal time. Pakistan's unexpected goal should serve as a warning but could also give a mental boost to an inexperienced team. Over the course of 90 minutes- things will go wrong but its important to be able to roll with the punches. What I didn't like: The insistence of play long hopeful balls to Wadi and the sloppy play in midfield was disconcerting. Ould Ali was right to take out Sameh Maraaba first as he had contributed nothing in his 50 minutes on the pitch. Mohammed Basim had his worst game with the senior team but his midfield partner, Shadi Shaban, didn't provide the requisite leadership and he was equally bad. Alexis as a CB: The jury is still out on this one. Looks like he could do a job there but playing as a centreback in a back three is significantly different to playing the same position in a back four. Stock Rising: Mahmoud Eid had one of his best games in a national team shirt, showing how valuable he could be as a winger on the right side- he combined several times with Nazmi Albadawi to great effect, including in the build up to the winning goal. What's Next: Palestine will travel to China to take on the Chinese national team on Tuesday, November 20th in Haikou.